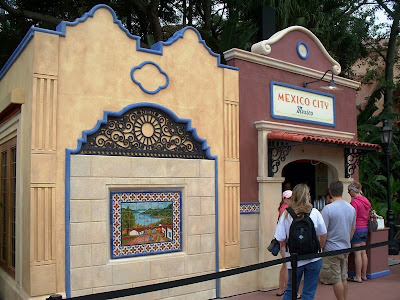 I tweeted earlier in the week that the Mexico City booth from the 2009 Epcot International Food and Wine Festival had become Taqueria Del Lago, a new quick service location in Mexico. 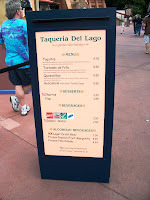 While I am unsure as to how long this stand will be a fixture in World Showcase, here is the menu, along with some pictures of the booth and menu, for those planning upcoming trips. Taquitos (9.75) – Beef taquitos topped with sour cream, queso fresco, and green tomato sauce. Served with refried black bens and Mexican rice. Tostadas de Pollo (8.50) – Chipotle marinated shredded chicken, black beans topped with lettuce, sour cream and queso fresco. Served with pico de gallo and guacamole. Quesadillas (8.50) – Grilled flour tortilla with Chihuaha cheese, served with pico de gallo sauce, refried black beans and rice.